In Letters to John Paul, Elena Kilner opens her heart to us; in fact, she bears her very soul as she shares her insights into the significance of the life of her terminally ill son. Words could never adequately describe the suffering she and her husband Pat endured during their ordeal. But, Elena dug deeply into their suffering and discovered beauty and meaning. In her postings, she gives us an intimate look into their family life. She also shares the outpouring of her love for her child and the stirring of her soul as she contemplates what John Paul is going through, what she and her family are going through, indeed what all humanity is going through. "You saw so clearly that John Paul’s life possessed a dignity that was radically equal to that of everybody else. His medical condition was simply the battlefield upon which this young warrior-prince would carry out his campaign. You saw in your son a reflection of God’s great plan for him and for you and for all of us. All of us have been blessed to see God at work in John Paul’s life and in the life of his family. But this blessing carries with it a great responsibility. If our love for this little one has enlarged our hearts, then that means that now we must love all the more. " "Daily saving the life of an immobile kid with a fatal disease raises some fundamental questions. What is the point of such a life? Which raises the prior question: What is the purpose of any life? Tribulations both reveal character and form it. JP's struggles revealed his parents' heroic virtue and fostered virtue in others." Listen to Elena Kilner speak at a Theology on Tap event about her experience with John Paul by clicking here. 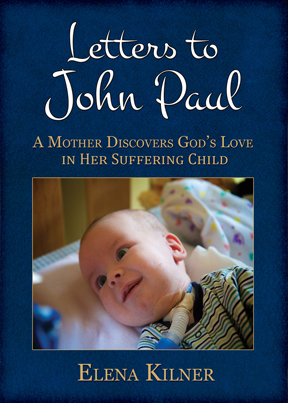 Read a review of Letters to John Paul by Meg Matenaer in CatholicMom.com by clicking here.